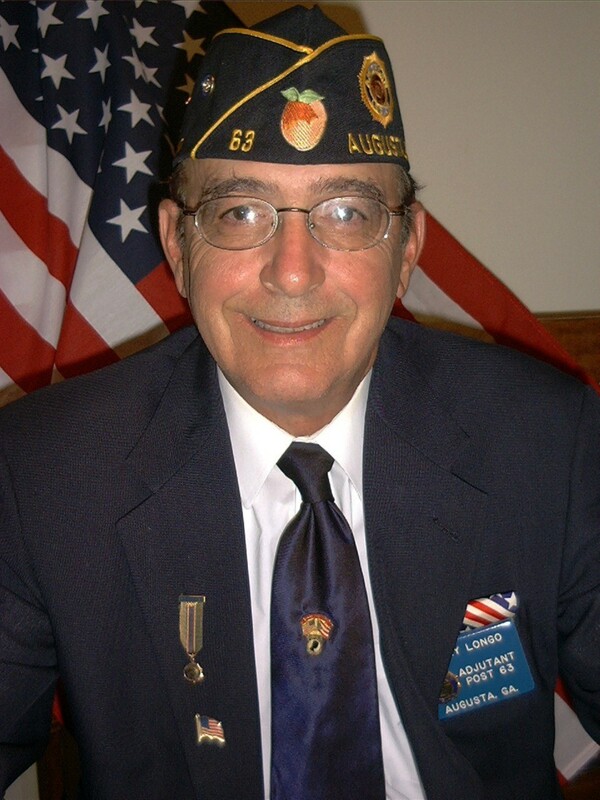 To Contact Us Please send e-mail to Larry Longo Post 63 Adjutant. FIRST OF ALL -- I would like to Welcome you to the web site of the American Legion Post 63. Located in beautiful Augusta GA. Home of the MASTERS golf tournament. We are located on the shores of Lake Olmstead. Next to the National Guard Armory on Milledge Rd.. . Thanks for "Still Serving America!!" As I continue to speak for the Good of The Legion, my thoughts and prayers are always with the families of the “missing in action” and the many disabled Åmerican Veterans that gave so much for our country. I trust in GOD that their well-being will be forever be a reality, they ensured our freedom and independence. Please mail in your 2004-2005 membership renewals as soon as possible after you receive the applications in a couple of months, this will save me time and I’ll be able to mail them out in a reasonable time frame. We actually did it!!!! Squadron 63 has exceeded the 100% membership goal set by the Department. Wow, what an accomplishment!! Bingo is at 1:30 PM on Saturdays and 7:00 PM on Tuesdays, we provide a 500 dollar jackpot. Pool Tournaments are held in the “Little Bar” every Saturday at 4:00 PM and Thursdays at 7:00 PM. Stop by Saturday’s we open around 10:00 AM, and talk about our military experiences and a multitude of other issues mixed with sodas, beer and sometimes a shot or two!! We solve lots of problems!!!! To all of you, I thank you for the opportunity to continue serving my home Post 63 as the Publicity officer apointed by our Commander Bob Cockrell. I do not believe it would have been possible with out the big push from Larry Longo. I do hope to enhance our membership and communications with each other through out the world, not just our nice neat little corner on the Lake. I am leaving April 1st for China and will not return until May 1st. May all of you have a wonderful good Friday, a great Easter, and May Spring bring the sun out in all ways. I look forward to seeing you all again as soon as I get back and get over the Jet Lag. Be - a - Legionnaire! You should join this brother hood of veterans and share in the joy's of assisting other veterans and sharing your story's and experiences with us --- We look forward to seeing you.. I showed up and dug with my hands through the pile. A shovel didn’t work. It was total misery. Three thousand people were in there and we couldn’t find anyone. Were did everybody go?? Marine Corporal Peter T. Regan, at ground zero, the World Trade Center. My life as a military veteran was OK, at least I thought it was, we had to hold our spirits high even though the sweat and tears of Vietnam were upon us. Our families were far away but our thoughts were always with them and our country. I guess our dreams of glory were somewhat shattered upon arrival back in the States to what appeared to be an ungrateful public. But that was then and this is now, America is the greatest, what other country had or has that “right” to demonstrate against the military, freedom, that’s what it’s all about!! Robert H. Jackson, Los Angeles, California. This is the link for the ROBERTS RULES of ORDER that all American Legion's adhere too during their meetings. "This Site CREATED by ^Rob of ^Robs WerLD" ©2002: ^RobsWerLD. All rights reserved.